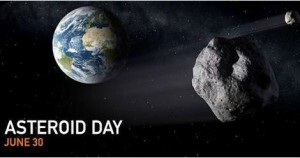 While you were enjoying (or not) the exceptionally warm weekend of June 30 — July 1, you likely did not know that Saturday, June 30th was International Asteroid Day. It’s a commemorative date of sorts, marking the day of June 30, 1908, when the “Tunguska event” took place in Siberia. On that day, 110 years ago, an extra-terrestial object flattened over 770 square miles of Siberian forest. No one knows exactly what caused it. It is largely thought to be an air-burst of a meteorite, perhaps exploding around five miles up in the air. This is considered an impact event, even though it left no impact crater, just scortched earth. Estimates of the object’s size suggest it was about the size of one or two football fields. It may have been a comet, it may have been an asteroid, no one really knows, but early estimates of the size of the explosion (since disputed), put the force at about 15 megatons of TNT, about 1000 times greater than the atomic bomb dropped on Hiroshima. The blast flattened some 80 million trees. Due to the remote location, there were no human casualities, but it would have easily destroyed a large city. So here’s what got me started on this piece: Many years ago, way back in 1977, I read a book called Lucifer’s Hammer. It was a sci-fi novel, the first apocalyptic novel I recall reading. By coincidence, I stumbled on a copy of the book as I was packing up some old books to donate to the library. All the other books went, but Lucifer fell out, and hid under the driver seat of my car. I just found it, so I thought I should write about it, and here we are. The book was dramatic to say the least. 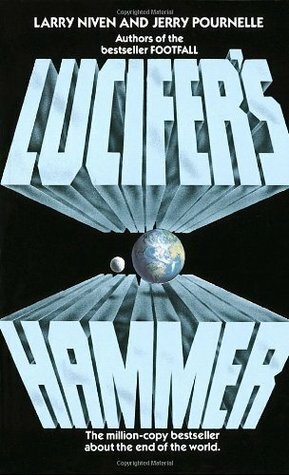 Lucifer, which turns out to be a comet, breaks up upon entering the earth’s atmosphere, and creates havoc around the world. Chaos ensues, and the rest of the story follows the survivors in the post-apolcalypic world. There have been countless end-of-the-world scenarios; they are one of the mainstays of Hollywood. With out an apocalypse of some sort, countless movies from Mad Max to Independence Day to the World War Z zombie apocalypse would never have been made. All this doesn’t even include TV series like The Walking Dead. Most of the movies and TV shows do quite well, at the box office and in TV ratings. We seem to enjoy the notion of the world ending in some sort of dramatic and spectacular fashion. Perhaps we imagine ourselves as one who survives, or hope we would be one of the ones who doesn’t. It seems from what I’ve read, that people, especially Christians have been having notions of the Apocalypse for centuries. Generation after generation, some folks think they are living in the end of times; that it’s going to be all over during their lifetime. Early thoughts of an apocalypse were often Bible-related, God ending mankind in some catastrophic way, perhaps an asteroid. Modern society (and Hollywood) has of course expanded on the theme. We (society) can meet our demise in an endless variety of permutations, from space invaders, to viruses, to zombies, not to mention prehistoric dinosauers if we visit the wrong theme park. So, why? What is the fascination with mega-disaster? Why do we fill movie theaters, almost gleefully watch people die by the thousands while we chomp on popcorn and candy? I can’t say I had any real ideas about this, but looking around online, I found a few interesting pieces. One suggested than an apocalypse must have two parts. The first is that real life always seem on the brink; poor leaders, broken economy, global warming, you name it; disaster is right around the corner. The second part, and the most interesting is it never actually happens. Millions may die, the world may be in shambles, but there are always survivors. Someone is left to start over, to re-boot the human race, better than before. So the essence of the apocalypse becomes hope. To be sure, some films break this tradition. On the Beach, and These Final Hours, both nuclear disaster movies, come to mind. But they are generally the exception to the rule. Most often, there are survivors, embattled, desheveled, and barely holding on sometimes, but by golly, the human race will survive! There are a couple of other theories out there which merit some discussion. The first one is that we just love to watch destruction. Sound lame? Then why do people rubber-neck at auto accidents, or why does a fire draw a crowd? Is there something in our nature that likes watching things destroyed? Another is that we have a fascination with death, and that death on a large scale lets us watch from the comfort of our movie seat. Another theory is that the apocalypse lets mankind start over. We screwed up, but we won’t the next time. It also lets indivduals theorize how they would fit in in a new world. Would they be a leader? A follower? A taker? A giver? Mankind gets another chance. Another thing — apocalyptic movies often open in the summer. The summer “blockbuster” is often about mayhem or one kind or another. Sooooo…. We’ve come a long way from Asteroid Day, but that sometimes happens when I just shoot off in a direction. Going back to original topic, just remember there are millions of asteroids out there — maybe one of them has our name on it. Why do we Love Apocalyptic Movies? Bill..always enjoy reading what you write!